Yamaha Motor's Communication Plaza Reaches One Million Visitor Milestone - News Releases | Yamaha Motor Co., Ltd. 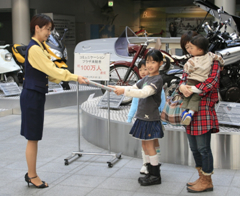 The Communication Plaza at Yamaha Motor Co., Ltd. (the “Company”) headquarters welcomed its millionth visitor on Saturday, February 28, celebrating by presenting a commemorative gift to the arrivals that day. Communication Plaza houses the Company's corporate museum in Iwata, Shizuoka Prefecture, Japan. Communication Plaza functions as the historical archive for a diverse range of Company products that have served customers worldwide. It features displays of historic models, with further depth provided by a library of background documents on the exhibits. The facility has also presented a series of special technology exhibitions and programs on various themes. At the same time, the Plaza has developed a rapport with the community through numerous events for families and children, such as motorcycle riding schools, engine dismantling/assembly workshops, and special guided tours of the Company's factories for school groups. Plans to build the Communication Plaza were developed around the time of the Company's 40th anniversary, with the Plaza opening 43 years from the Company's founding on July 1, 1998. The million visitor milestone comes in the 11th year since the Plaza's premiere. Over the years there has been a steady increase in visitors, including guests from abroad. Attendance in 2008 set a new record, topping 130,000. Moving forward, the Communication Plaza will continue serving as a medium for dialogue between the Company and the community.